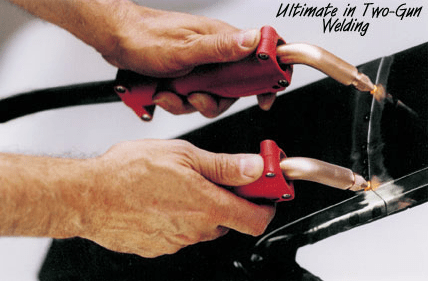 TITE-SPOT Welders, Inc. offers you the ultimate in Two Gun spot welding. The TITE-SPOT Cool Cords provide the technician with Two-Gun Welding, One-Gun Welding, Pull Stud Welding, Heating and Shrinking. Also, see page 14 for Electric Dent Wizards.Forced air cooling is a patented Cool Cords feature. Compressed air from your shop is injected into the cables where the cables bolt onto the transformer. This also helps cool the transformer, improving the transformer’s performance. The air is then released under the handles causing a Venturi effect of fresh air. The cooling allows the technician to work without gloves. This cooling air also provides a well-ventilated environment protecting the technician from the fumes of the welding process.The duty cycle of the Cool Cords is eight times longer than cables without compressed-air cooling. 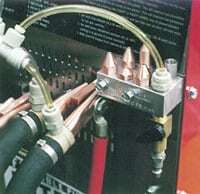 Compressed air cooling also extends the service life of the TITE-SPOT Cool Cords by many years.The Cool Cords cables are 8′ 6″ long (tip to tail) a good working length for the technician. The cable is an industrial grade 250 MCM Neoprene jacketed welding cable with 2499 strands of 30 AWG pure copper wire. The cable has a minimum bending radius of 4 inches for maximum flexibility. This cable is 20% bigger than the competition’s 4/0 cable. Bigger cables mean lower current loss, cooler running, and longer life. The handles are made of glass filled nylon and are designed so the technician can use them for hours and not suffer hand fatigue. Glass filled nylon is a high impact material that will give years of heavy duty service. One of the handles has a trigger built in. The trigger is nicely mounted to prevent accidental triggering. The handle also is designed to capture the welding tip electrode holder solidly. The electrode holder is drilled and reamed to accept a number one Morse taper welding tip. The welding tip screws into a screw-in adapter. The tapered screw-in adapter fits into the welding tip electrode holder. 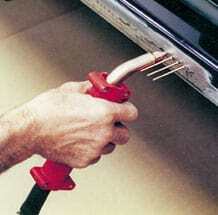 The screw-in adapter prevents injury to the electrode holder and makes removing the welding tip easy. The screw-in welding tip can be removed and sharpened easily. A sharpening tool is provided and it is powered by your electric drill. There is one pair of screw-in adapters and one pair of welding tips provided with the Cool Cords. ADVANTAGES Safety: Spot welding is the safest form of welding in the Body Shop Industry today. There are no open flames like a torch, and there is no arc that the technician must be shielded from as with a MIG, TIG or STICK. A technician needs only clear eye protection.No more bulky, sweaty, welding helmet to wear!Spatter is a constant threat to the safety of the body shop, personnel, and the vehicles in the shop. Technicians spend many hours removing interiors, covering glass, and protecting other vehicles from spatter. At one time or another, all technicians have been burned with the spatter from a MIG welder, even in the safest of shops. Spatter is virtually eliminated when using the TITE-SPOT Cool Cords. Safety is improved and productivity increases. Spot welding simply melts the two pieces of steel together.Speed: Body shops can complete the spot welding process on today’s vehicles in less time and spend less time protecting the vehicle from the dangers of sparks. Getting spot welds ready to paint is faster than any other form of welding. Body filler works well over spot welds. Appearance: Only a spot weld looks like a spot weld. The “New Car” appearance of a spot weld installed with a TITE-SPOT is impressive. Get higher customer satisfaction with “factory type welds”. Warpage: The spot welding process is so quick that warpage is just not a problem. Overlap welding can be 30% to 40% of collision repair.Today’s vehicles are easily repaired using spot-welding techniques. Two-Gun Welding has been developed to aid in the installation of replacement panels. Technicians can install new panels at the factory seams or make new overlapping joints. The TITE-SPOT Cool Cords can be put to work using one of two methods; Two-Gun Welding or One-Gun Welding.The technology of single sided welding is quite simple, the electrode applies pressure to the outside layer of steel which presses it onto the inner layer of steel. Current is passed through the outer layer and inner layer of steel heating them quickly. When the welding temperature of the steel is reached, the weld is formed. This takes about 0.2 to 0.5 seconds. A: Sand paint and primer off front side of old part. B: Sand primer off both sides of new part. A: Overlap new part onto old part. B: Press guns firmly on new part so that parts fit snugly together. Prepare welded joint for primer or filler. 1. TIP DIAMETER: It is important to maintain the two gun welding tips at a 1/8″ diameter (3.2mm). High current density can only be achieved through small diameter electrodes. 2. THREE CLEAN SIDES: Both sides of the overlapping part must be bright metal and the overlapped part must be bright metal. Under special conditions “E Coat” can be left on the inside of new parts. Special procedures are taken to achieve this technique. 3. GOOD FIT-UP: The parts must be touching or the parts cannot be welded together. 4. SET WELD TIME: 1/2 – 2 seconds or use manual timer. The TITE-SPOT Cool Cords are two 8′ 6″ long 250 MCM welding cables that are air-cooled with compressed air from your shop. The handles are glass filled nylon. Also included is an 8′ long ground cable for pin welding, heating and shrinking with a modified 10″ Vise-Grip for a ground clamp. 1. Air Block – Tool Caddy has places to store spare welding tips and sharpening tool. 2. One set of spot welding tips with screw-in adapters. 3. One Stud Welding Tip. 4. A sharpening tool that fits in your electric drill to sharpen electrodes. 5. Air control valve for the compressed air cooling and air hoses, fittings and tee. The Super-Utility Kit is part of the Cool Cord package. The Super-U-Kit allows the technician to do Stud Welding, Heating or Shrinking quickly and easily. This package consists of one 8 foot long 1/0 ground cable with ring terminal ends, ground clamp, and one stud welding electrode. It is a wonderful money maker!Stud Welding: Using the triggered Cool Cord Gun and the 8′ long ground cable and clamp makes a superior stud welder. Stud welding with the Cool Cords is easy because power and weld time are adjustable. Nails can be welded very close together without bending other nails out of the way. The change from spot welding to stud welding is fast, just put the stud welding tip in the Cool Cord Gun and put the nail in the tip. Heating or Shrinking: Can be done with the triggered TITE-SPOT Cool Cord and the 8′ long 1/0 ground cable with ground clamp. The Two Guns can heat nuts and bolts without burning paint on fenders and door hinges.